If you decide to find an alternative to Pages your first step is to know how to move your documents out of Pages. The only program which will open Pages 4 files is Pages 5, which is what you are trying to avoid. Documents which contain only text, or a very few draw objects such as lines, can simply be 'select all'd and copied, then pasted into your new program of choice. Draw objects must be selected as 'Inline (move with text)' - floating objects will not be copied. If you have a complex drawing with a lot of lines, rectangles and text boxes, you can select all only by dragging the mouse over everything; but then it will be copied as a single image and when pasted into another program the individual parts cannot be selected. You can get round this by exporting as a Word document, but only OpenOffice and its relatives (see below) and possibly MS Office will show the drawing when the document is opened in them: other programs cannot open the images. I found that moderately complicated drawings could be opened this way, but that for example a large family tree was hopelessly messed up, and a large and complicated technical drawing had a few placement errors in it. Microsoft Office ($139.99 for one user and one Mac, with more expensive options available) is the most powerful and most widely used program; but it is very expensive and also very complex to use; and as said on page 1, if you need to use it for compatibility with others you are probably already using it and this discussion is irrelevant to you. An alternative is the free office suite OpenOffice (left), together with its offspring NeoOffice and LibreOffice. Of them, I prefer OpenOffice to LibreOffice - Neo Office is no longer free, as the others are, and its design is a little more awkward. A page which compared them in some detail has now gone offline;it concluded in the end that they are very similar and the choice is a matter of personal taste. OpenOffice (which has changed hands a couple of times and is now developed by Apache) is a well thought out and quite powerful set of programs, though there may be an issue with stability - on Snow Leopard I found it consistently crashed if QuicKeys was running, and even without QuicKeys it would crash occasionally, though others have had no problems and on Mavericks it seems to be stable, so far. It has fairly comprehensive drawing tools, and facilities for endnotes and other bibliographical requirements. It certainly has much to recommend it, in particular being free. It can save in MS Office format if required. It will run on OSX 10.7 and higher, and requires Java to be running. 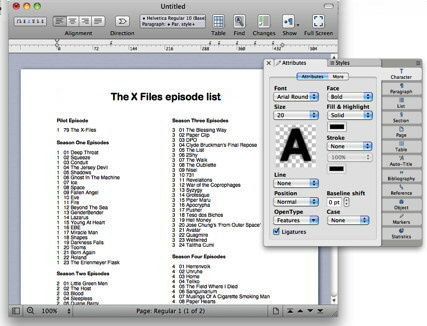 Also free are TextEdit (bundled with all Macs) which in its Rich Text mode provides very basic word processing with text formatting and tabs; iText Express (free) adds a few facilities to this and will run on OSX 10.6 and above (there is a 'Pro' version for $11.99). 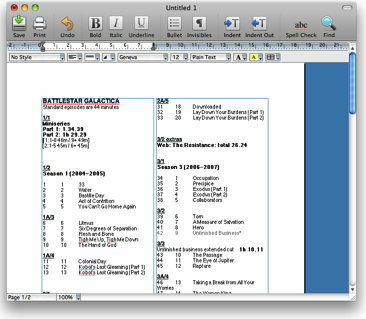 Bean (free) is also a capable basic word processor with some additional facilities (including columns, optional vertical ruler, and copy and paste rulers) though development on it has ceased. It runs on OSX 10.13 and above, with earlier versions available for back to 10.5. All are useful for very basic and easy Word processing though they fall far short of Pages' capabilities. This leaves three main word processing programs worth considering. If you are only interested in text word processing, with no draw objects such as lines and rectangles (though you will be able to import images), Mariner Write (right) ($29.95, download) is a capable and easy to use word processor with a reasonable range of facilities. Images can be imported as inline or floating with text wrap, though they cannot be resized; it has the usual facilities such as columns, tables, and stylesheets, and usefully it can copy and paste rulers with their tab and margin settings (something neither OpenOffice nor Pages can do). It uses its own format but can also save in RTF or what is described as RTF (Word) (they appear to be the same). It will run on OSX 10.7 and above. If you are happy with fairly basic facilities you may find its operational simplicity preferable to the other options; it is a bit expensive compared with the other similar options, though it is better supported than Bean. If you want advanced text handling facilities, but are not concerned about drawing objects, Mellel (left) ($49, download) is a highly functional word processor with many more facilities than Mariner Write. Developed by an Israeli software firm it is specifically designed to handle non-Roman languages (including right-to-left) and has sophisticated text handling abilities. With more options it is obviously more complex to handle, but on the whole the layout is reasonably logical though I found the ruler and tabs a bit fiddly. It has no drawing facilities or text boxes, but can import images, both inline and floating with or without wrap, and resize them. It provides tables but options for placement on the page are limited. It can copy character and paragraphs fomatting attributes but not rulers. It saves in its own format, but can export to several formats including Word, and runs on Snow Leopard or above. It's very good value with all the facilities, and as long as you don't mind getting used to the complexities and don't want to draw objects it's a good choice. 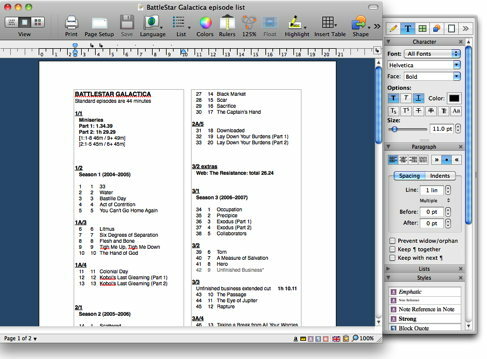 However as a direct repacement for Pages, Nisus Writer Pro (right) ($65) is a closer fit. (There is also an Express version with fewer facilities.) It can do most things that Pages 4 can do (barring the layout option and a few minor items like curved shadows). It can copy and paste rulers, has comprehensive Style facilities, can draw a wide range of objects with size, colour, behaviour and shadow options, has several style of floating text boxes, imports images flexibly, provides all the usual facilities such as tables and columns, and has a configurable toolbar to which you can add any menu items - you can also attach a keystroke to any menu item (though of course you can do this with any program in System Preferences). It has a range of macros, and a simple macro language in which you can write your own automation. There are a few things it won't do - there is no separate layout option, locking draw objects or images to prevent accidental moving or deletion is not possible, curved shadows are not available, and tables have to be placed within text boxes if you want to move them freely and wrap text round them. If you export a document in Pages which has a lot of drawing items in it into Word, Nisus Writer will not import them. It can save in a number of formats, including Word, though basically it saves in RTF with its own additions. This means that text-only documents can be opened in TextEdit or any other program which will read RTF (which would be most of them), though any drawn or imported objects, and advanced facilities such as headers, footers and colums, will not appear. This is a valuable facility, as even in the extreme event of the program becoming unavailable and rendered unworkable by a system upgrade (as with AppleWorks) you can at least easily retrieve the text portion of your documents in a format which is unlikely to become obsolete. The current version requires El Capitan OSX 10.11 or above, though older versions remain available here - 2.0.7 is well featured and runs on Snow Leopard. It's the most expensive of the programs I've listed (barring MS Office, of course) but if you want a clear replacement for Pages it's certainly the best. 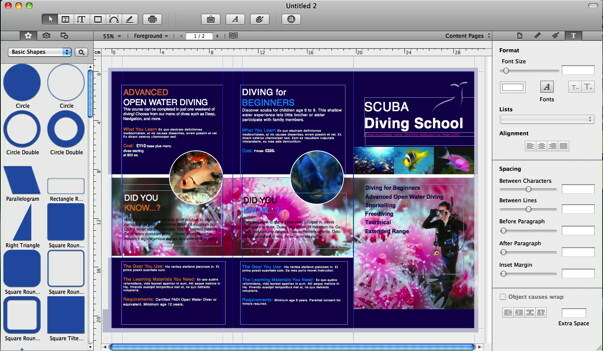 However, Pages 4 also provides a 'layout' (Desk Top Publishing) facility, where all text is in text boxes and there is more layout flexibility, together with a number of attractive templates. 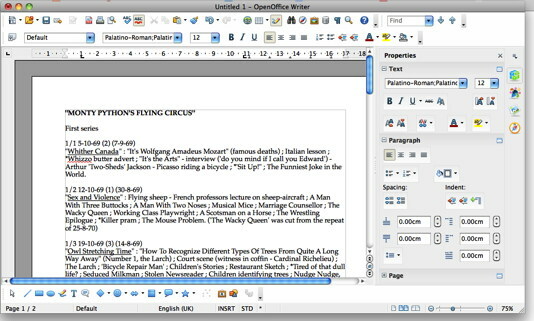 Though you should not regard it as a word processing program (doing so would be frustrating with all text in boxes, so that there is no automatic progression to the next page), Swift Publisher 4 ($19.99 with an optional addon including a large clipart collection and 100 fonts at $9.99) is a very capable Desk Top Publishing program which can do most things Pages can do and more. It includes a number of templates, and has extensive facilities. As with most DTP programs it saves in its own format not openable by other programs. It runs on OSX 10.10 and above. An earlier version which will run on Snow Leopard is also available. (The image below is version 3: higher versions are basically similar). All save in their own file formats which cannot be opened in other programs, though Nisus Writer can save in its own version of RTF (though other programs can see only the text), but all can Save As or Export in other formats (see the footnote.) All the non-free programs I've listed offer free trials (MS Office of the subscription version only); and all (except MS Office) allow you to install for one user on one desktop and one laptop Mac (in some cases more) on a single licence (MS Office allow this only on the subscription version). Swift Publisher, Mellel, iText Pro and Nisus Writer are also available in the Mac App Store for installation on any Mac signed in with your Apple ID (though no free trials here). So my choice to replace Pages would be Nisus Writer Pro and Swift Publisher 3 - the cost mounts up, of course - with Open Office for handling any Pages documents with complex drawings in them; but Open Office alone may well be suitable for many people; and Mellel, depending on your requirements, is also a good choice. If you have Pages documents with complex drawings in them I would strongly recommend always exporting a Word version after you've done any editing: this gives you a copy which can be opened in OpenOffice should it ever become impossible to open it in Pages; you will probably need to go through doing some adjusting but at least you will have a workable version. The next page will examine alternatives to Numbers, where the options are not so straightforward. MS Office: .docx, .doc, .dotx, .rtf, .txt, .htm, .pdf, .docm, dotm, .xml, mht. TextEdit and iText Express: .txt, .rtf, .html, .webarchive, .odt, .doc, .xml. Bean: .bean, rtfd, .rtf, .doc, webarchive, odt, docx, .pdf, .txt. Nisus Writer Pro: .rtf, .rtfd, .dot, .doc, .zrtf, .txt. Swift Publisher: spub, .pdf, .tiff, .jpg, .eps. © Roger Wilmut. This site is not associated with Apple nor any program mentioned here.